What’s happening to my tea? In December 2015 John, Niladri and I attended the AGU annual fall meeting to present the preliminary findings of our research. 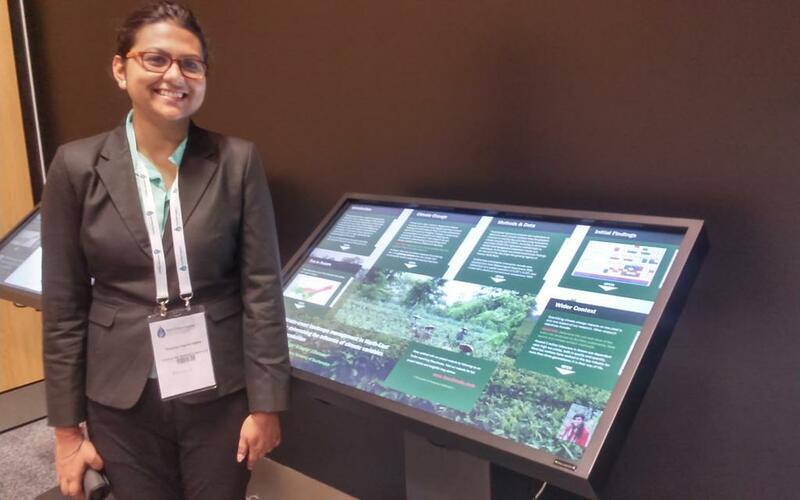 We presented two posters; one focussed on the value of the tea landscape and the other on managing water resources for a climate-smart approach. Our sessions were very engaging with a range of questions from those interested in the climate-yield analysis methods, to impacts on the livelihoods of tea stakeholders, to concern regarding a reduction in personal tea supplies. We are now working on the last stages of data collection and finalising all our analyses, writing up our findings for publication in journals. We are also starting to develop a basic web-based decision support tool for the Tea Research Association to use in-line with their advisory services for member gardens. Training will be undertaken at TRA in February and wider dissemination of research will also occur through a final workshop and community fair with dates to be confirmed. When you think about tea production, India, China and maybe Africa spring to mind, but what about the UK? My name is Catherine and I am currently completing my MSc in Applied GIS and Remote Sensing at the University of Southampton. As part of the final semester we are required to undertake a 20,000 word research project, which sounds like a rather daunting task. Yet, the key is to choose a topic that is of interest to yourself and a wider community, and tea definitely hits that brief. 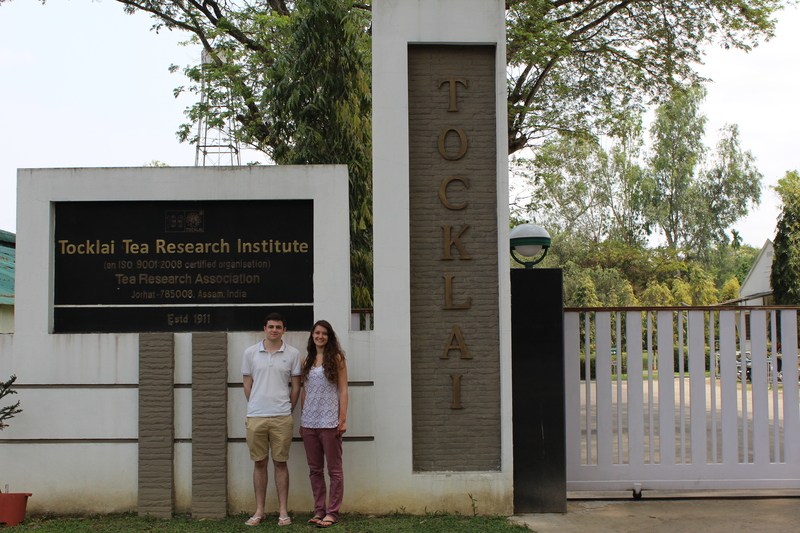 A few months ago Connie and Patrick, two of my course mates, visited Assam as part of a UKIERI project. They collected a variety of data on the locations of shade trees and soil properties within a number of tea plantations for their respective projects. Their post ‘Shade, food and an egg’s lost luggage!’ details a joint experience around Assam and provides additional detail on each of their projects, so definitely take a look. 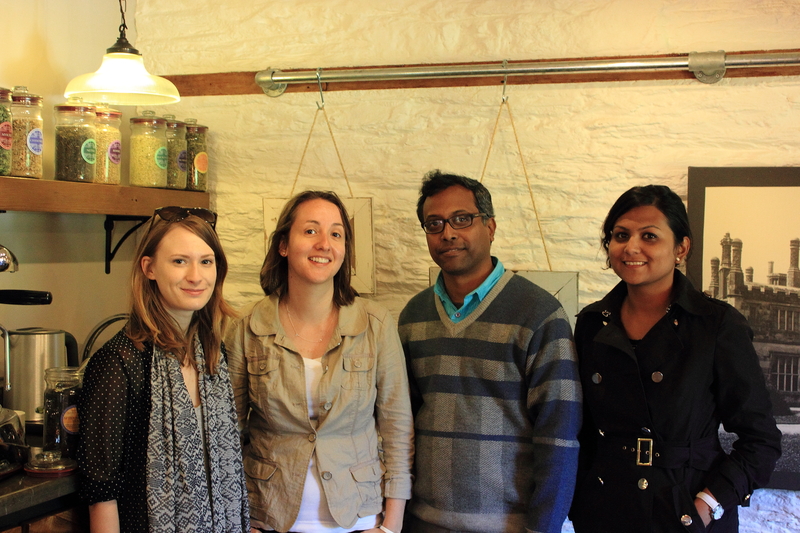 My project moves away from India and instead focuses on tea growth within parts of the UK. This may seem a bit strange as yes, we Brits love to drink a good cup of tea and are one of the biggest tea drinking nations out there, yet when it comes to home grown tea we are pretty limited in awareness, knowledge and experience. Tea requires very specific environmental conditions to grow, and as such the potential for growth (particularly under future climate change) can be modelled. Specifically, my project looks at the climatic, topographic and soil conditions found within the UK and whether, when combined, suitable areas for growing tea can be highlighted through using Geographical Information Systems (GIS) and an ecological habitat suitability model. Unfortunately this means I did not get to join Connie and Patrick on their adventure to India, however I did get to go to Cornwall to find more out about existing English tea production, and lucky for me the weather was beautiful. 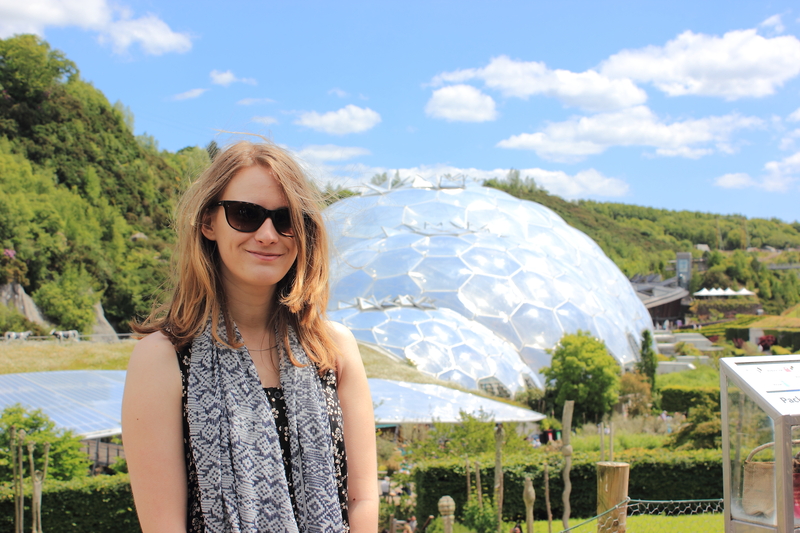 First stop was the Eden project, located just outside St Austell. Whilst visiting I bumped into one of the gardeners who manages the tea section. Unfortunately they are really struggling with keeping the soil pH at optimum growing conditions, which for tea is around 4.5-5, and attempts to lower the pH through various techniques including fertiliser has led to the presence of the Phytophthora pathogen. So sadly, many plants have had to be removed. The remaining tea plants appeared rather unhealthy and yellow, despite daily irrigation and ‘suitable’ climatic conditions. Tea growth at Eden made me aware of some of the difficulties associated with growing tea and the extreme practices required in order to ensure successful growth. However, my second destination in Cornwall led me to one of the only successful British tea plantations, Tregothnan, where there were many healthy looking tea plants! Tregothnan estate is located near Truro, Cornwall and is one of the only commercial tea plantations to supply English-grown tea to British supermarkets (blended), as well as high-end London stores such as Fortnum and Mason at a premium. Planting first began in 1999 and after 6 years the first plants were fully established and ready for harvest. Currently tea is grown in around 40 acres of the 6,000 acre estate, although there appear to be plans to extend this to 150 acres over the coming years. Whilst we were there we observed innovative field technology which could contribute to future cultivation; trials for mechanised planting which is currently not undertaken anywhere else in the world. We also had a tour around the estate and the incredible gardens which display a range of rare plants taken from all over the world, on a par with Kew Gardens! We also got to taste some of this English tea and take some produce home. Ellie was particularly happy as she procured a tea plant to grow at home. Next week I will be attending the Ethical Tea Partnership annual meeting where I will have an opportunity to engage with multiple tea stakeholders and get further ideas for my research, and perhaps kick-start a career in tea! When you see cows and goats roaming around or rather lazing around on the roads, creating havoc for the commuters, it’s Assam. But when you see sheep grazing in lush green highlands and cows that are very different from the ones you see back home, then wait, you are in Scotland! It’s time for the second exchange meet of the UKIERI project for the Indian team to visit the UK. 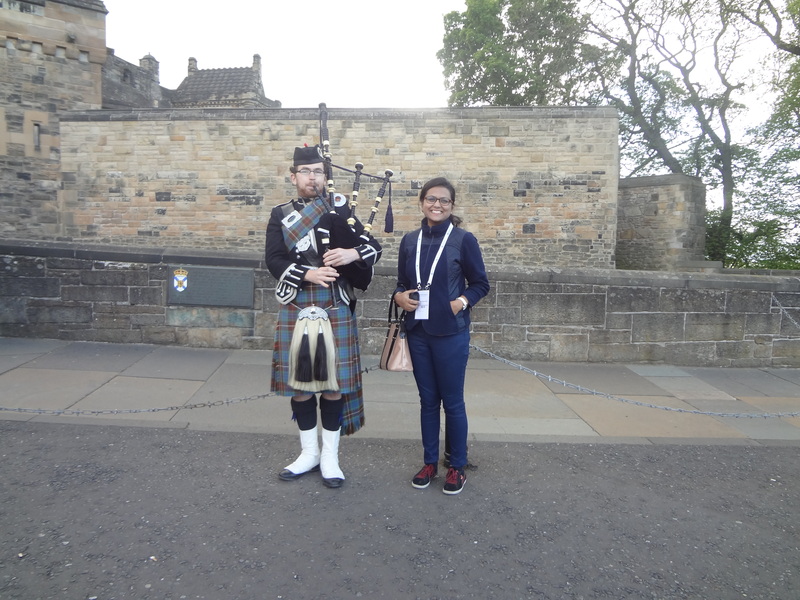 Our visit lasts for three weeks starting at Edinburgh, Scotland. So this time it has been my utmost privilege to attend the World Water Congress XV held there by the International Water Resources Association (IWRA) from 25th – 29th May, 2015. I would like to start with Edinburgh. As lovely as the name itself, Edinburgh is a thrilling city. The journey from London by train was striking as the train moved along the coast of the North Sea (of course you need to sit on the correct side of the train to get that view, and I am the lucky one in this case). 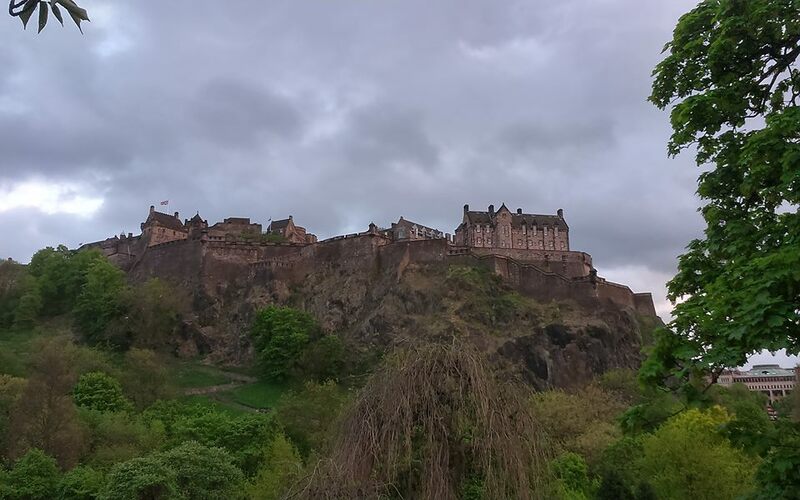 Home to the Edinburgh Castle and many historical structures and buildings, all of which looked like castle to me, I had the most amazing time in those five days. Streets buzzing with people (mostly tourists) moving around, bagpipers playing, quirky shops, street performers, variety of cafes and Scotch whisky stores, cool breeze (I couldn’t find a stronger word for it, as it was freezing for me! ), Edinburgh will win your heart at the first sight. It definitely will soothe your eyes almost immediately. And what added to my delight was that I could very well understand the Scottish accent! To take that to my credit, I would say that sometimes it’s very hard to comprehend (as told by my colleagues in England)! Moreover, working on climate, and not talking about the weather of Edinburgh won’t be fair. But what can I say about it…That’s the beauty about it; it’s so unpredictable that you can’t be certain about it. It’s sunny this moment and pouring the next! So take your raincoat and umbrella (which would just turn inside out; thanks to the wind) the next time you’re there..
Coming to the conference, I presented a poster entitled Climate-smart landscape management in North East India: determining the influence of climate variables on tea production under the session Climate Change, Impacts and Adaptation. The poster reflects the preliminary results of our analysis that we have undertaken for the North Bank tea growing region of Assam. It is my first international conference at an international location and also my first time in Scotland and the experience I would say is mind boggling! The sessions varied from transboundary water resources issues, water governance, the monetary and non-monetary aspects of water, climate change loss and damage in terms of water, management, food security, links with energy, food and environmental sectors and a lot many water-related issues. There were some special sessions on water and mountains, water-energy-food nexus etc. A documentary was also screened at the conference named as A Thirsty World which echoes the circumstances of people living in various parts of the world having access to very little water or no water at all. Besides presenting the paper, I felt that it opened a whole new set of opportunities in terms of networking with other delegates who have come from various parts of the world, working on a diverse range of topics. Knowing the views and arguments of such renowned scientists and professors is an excellent prospect in itself. I had to push myself to speak to such expert people, and set targets for interacting with as many people as possible. I even managed to get some business cards! Conferences like this provide a brilliant platform to build your own network for future collaborations and projects. Next, I am heading to Southampton for two weeks to engage with our research. We will discuss the development of a DSS (Decision Support System) for our project, as well as fit in a couple of trips to visit Cornwall to speak to the Tregothnan tea estate manager and attend the Ethical Tea Partnership annual meeting in London. I am excited and looking forward to these events. I must extend my thanks Ellie for making me feel at home in the UK and arranging all our exciting work activities; Ellie and Niladri for being such supportive mentors; and to my new friends in Southampton – Patrick, Connie, Heather, Hayley, Vera and Serina – for baking wonderful cakes. This will be my last visit to the UK on our project, but I hope to come back soon. I will miss the wonderful people I have met and will cherish the rest of the time I have visiting on my last trip. Let me tell you I am having the time of my life; exchange programs like UKIERI definitely make your life worth living! Shade, food, and an egg’s lost luggage! We are Connie and Patrick, two MSc students studying Applied GIS and Remote Sensing at the University of Southampton. Our average day is spent looking at satellite images of the world on computers. In many of our assignments we often find ourselves wishing we could visit these places to see what they are really like, and to provide real-world context to problems that we are trying to solve. Sometime in the middle of our coursework-strewn semester, such a unique and exciting opportunity arose to fulfil this dream (as part of a UKIERI project) and we jumped at the chance to conduct research in Assam as part of our masters dissertation projects. Why does lowland tea need shade trees? 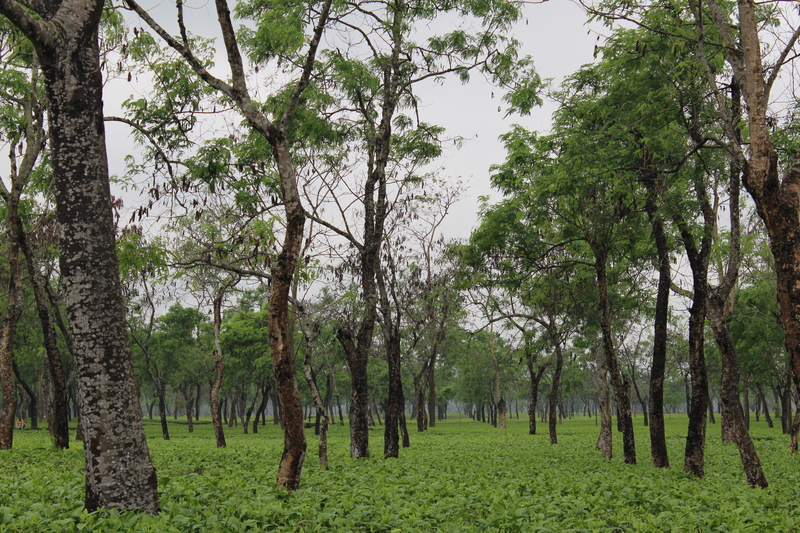 Unlike some other parts of the world, the tea plantations in Assam are in the lowlands, and because of this, shade trees are essential to protect the growing tea from the sun and produce a favourable microclimate. Yet despite their importance, I [Connie] noticed that few remote sensing studies (using satellite images) have looked into shade trees – most consider only how to detect tea, with some even complaining about the shade trees getting in the way. So my project focuses on these misunderstood trees, considering whether the density of shade trees in an area can be estimated using low resolution satellite imagery that is freely-available to everyone. I plan to use high resolution imagery to train a classification, and in the field I wanted to collect data on the shade trees to act as a form of accuracy assessment. To do this required collecting GPS locations of the shade trees, which seems easy enough in theory. Yet having never been to a tea plantation, I didn’t quite know what to expect; and on the morning of our first day in the field, I soon realised that the field work I had planned, from the comfort of my home in Southampton, was impossible. There were too many trees in a vast area of tea to collect data on all of them, and most of the area was inaccessible to me as the tea is too closely planted (and too thorny) to move between. So I had to quickly consider alternative sampling strategies, and decided it would be best to collect the locations all trees along the edges of a section (one part of a plantation), and some of the rows in the middle where it was possible to walk along narrow tracks. In each of the three plantations visited, I collected data in sections with different densities of shade tree to ensure I captured data across a range of conditions. Now back in Southampton, all that’s left is to get some cloud-free imagery (which might be a challenge over Assam!) and get properly stuck into my project, to see whether it is actually possible to find shade trees from space. Tea drinking tastes nice but what do workers eat? In many of Assam’s tea estates, the practice of inter-cropping takes place, where other crops are grown alongside the primary crop of tea. In particular, rice paddies are often grown in the drainage areas between the stands of tea by plantation workers, and are an important source of food. 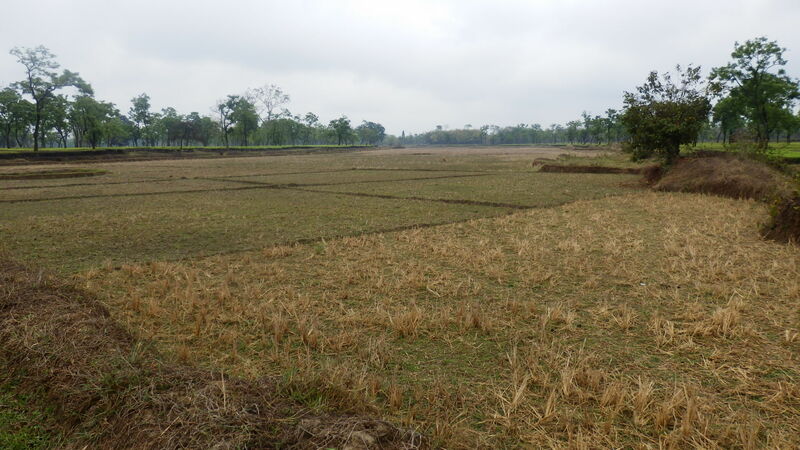 Whilst regulations are set for the application of chemical fertilisers and pesticides, none exist for the growing of rice paddies as these are non-commercial crops. This is potentially an issue as the leaching of the chemicals from the tea stands can potentially enter the areas used to grow rice. 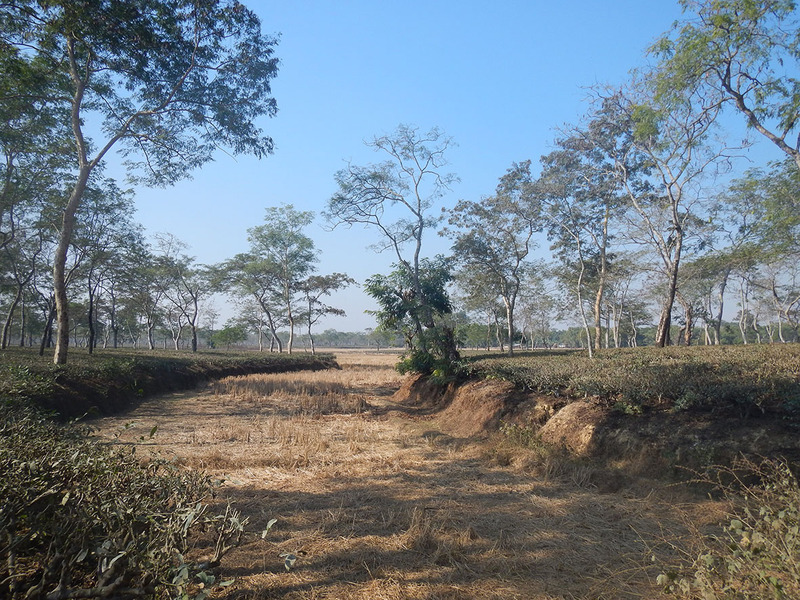 My research is attempting to investigate whether leaching is taking place and calculate the amount of land that could be used for inter-cropping to provide adequate food sustenance for tea workers’ livelihoods. During our trip I [Patrick] was able to visit three separate tea estates and collect soil samples as well as locational information about land cover. Compared to the previous places I have completed fieldwork (spectacular mountain ranges, glaciers and of course the bog-filled New Forest), the tea estates were a stark contrast. I was overwhelmed by their scale, with a sea of lush green leaves in every direction. What appears a perfectly neat and continuous surface of green conceals an intricate network of surprisingly deep drainage ditches that eventually widen into vast channels. Aside from the weather and the fairly rugged terrain, fieldwork was actually easier than any other environment I have worked in due to the fantastic support given to me. Estate managers showed keen interest in our projects and were very helpful in suggesting good locations to collect samples. Data collection was made much easier due to the assistance of plantation workers in collecting soil samples, whilst myself and Debojit (TTRI technician) recorded GPS locations and catalogued soil samples. In total we collected 270 samples in all weathers, ranging from searing heat to torrential downpours (it wouldn’t be a geography field trip without rain!). Back in the TTRI lab, I begun the slow and somewhat painstaking process of sorting, labelling and drying the samples collected in the field. It was at this point that 270 samples didn’t seem like the best idea! However, I persevered, and I’m looking forward to analysing the results to see what can be determined, in conjunction with processing high resolution satellite imagery to determine potential inter-cropping areas. Our reasons for wanting to visit Assam extended beyond simply academic interest, and the experience proved incredibly fulfilling. The flora and fauna is unique compared to anywhere else we have visited and we were able to see monkeys, giant snails and water buffalo during our visit. 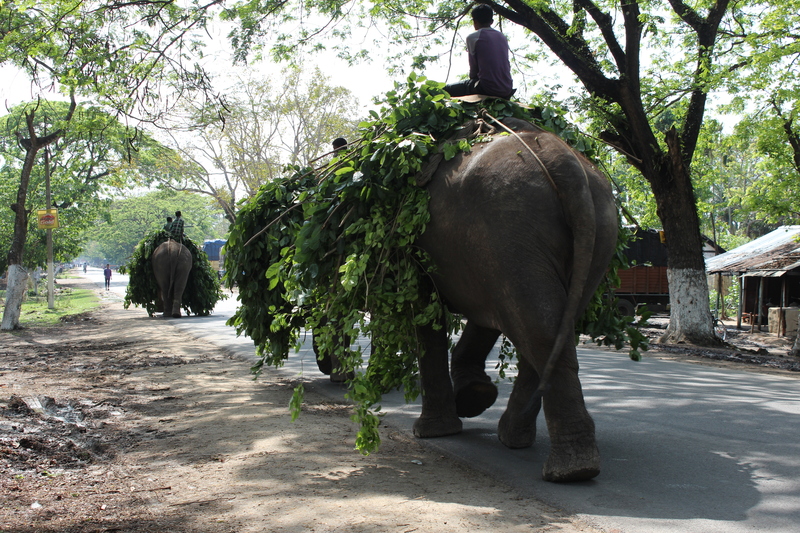 One of the most unforgettable experiences was seeing working elephants in Kaziranga National Park being being ‘driven’ along the road by children who were mounted on their backs. Their size and the speed they moved were amazing. Aside from the characteristic tea plantations of the landscape, another iconic part of Assam we couldn’t miss was the mighty Brahmaputra river. With parts of the river 10km wide, this is something that can only be appreciated in situ. Our exposure to Assamese culture extended into the diverse cuisine. Portion sizes in India are unrealistically large and ensured that we were continually full. One of our particular favourites was Gulab Jamun – a sweet which Connie compared to a mini sticky toffee pudding. On a side note about food, we were informed by one of the ladies in the institute that in the local Assamese language, Connie means ‘egg’. We found this hilarious, especially as Connie doesn’t like eggs, or tea for that matter. But no visit to Assam would be complete without sampling the excellent tea. A truly unique experience was the opportunity to join in the daily tea-tasting in one of the tea estates, with tea that was freshly processed from the factory just hours before. This was a dream come true for Patrick who is an avid tea-drinker, and all round tea fan. Tea-tasting is taken just as seriously as wine-tasting in vineyards, and has as many technical terms to describe each and every aspect. It is a moment of great importance for the tea estates, as it determines the guide price that each variety will be set at at auction. It turns out that tea-tasting is very difficult and best left to those in the know. 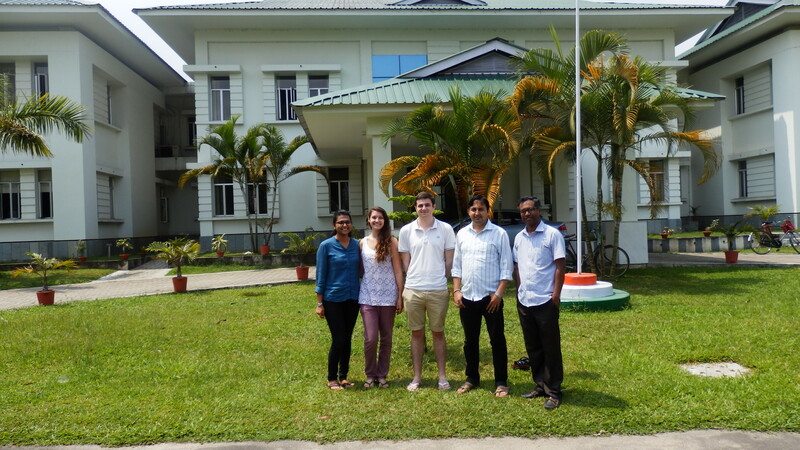 Our initial reasons for coming was both for collecting important data for our MSc research projects, but also to experience Assamese culture and working in an entirely new setting. Whilst we were able to fulfil and exceed these expectations, the main thing we have taken from our experiences has come from the diverse range of people we have met. Everyone at Tocklai was extremely welcoming and hospitable, and it is for this reason that we both had such a memorable trip. Thank you to the University of Southampton, TTRI and UKIERI for providing us with such a fantastic opportunity. I have recently returned from a visit to Assam as part of a wider project assessing the impacts of climate change on tea plantations and the livelihoods of their workers. As highlighted in a Guardian report, tea plantation workers often suffer from the most distressing aspects of poverty beyond, though often consequential from, a lack of income. This Guardian report presented the challenging conditions under which tea plantation workers live and work, leaving families prey to human traffickers. To add to the vulnerabilities highlighted in this report, climate change is also adding to the burden placed on households as they strive to secure a livelihood. The impacts of climate change could have severe, negative impacts on the ability of tea plantation workers to enhance their well-being. Not only could climate change make it more difficult for tea plantation workers to lift themselves out of poverty in a sustainable manner it could make already precarious livelihoods more challenging. Here, I offer some insights on how climate change could influence one of the key components of well-being; the ability to access sufficient and nutritious food. 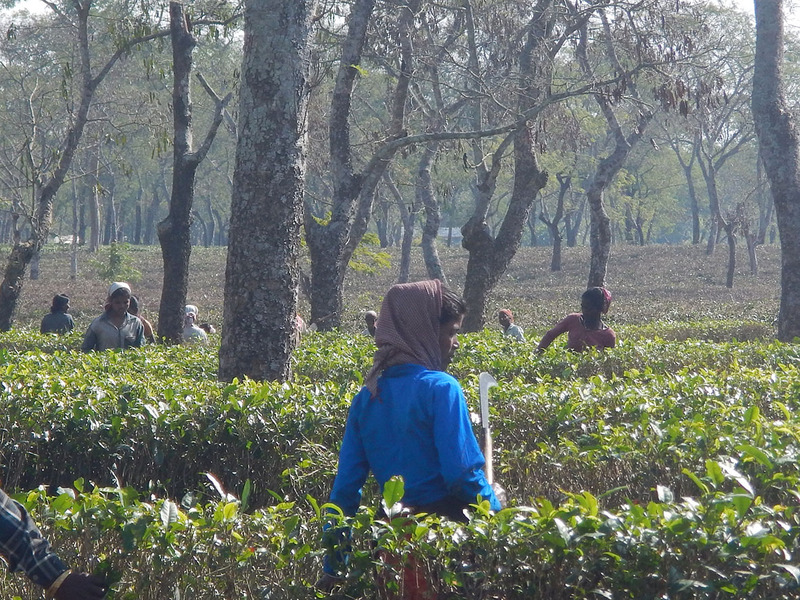 Tea plantation workers in Assam. Typically people go hungry not through there not being enough to eat but due to not having enough to eat, in other words, a result of barriers in accessing food. This view was articulated by Amartya Sen, the Nobel prize winning economist, when he outlined the various means of entitlement people have to access food. These entitlements typically include access to food via own production (subsistence), trade and purchases, labour, and transfers of food. To illustrate how climate change may exacerbate the vulnerability of tea plantation workers I speculate on how it may influence their ability and means to access food. One of the most common methods of accessing food is through purchasing it in markets with earned money. This is contingent upon two factors: the ability to earn money and the presence and ability of markets to supply food at affordable prices. Tea plantation workers earn money through labouring on tea estates receiving a daily wage of less than 100 rupees (less than £1 a day). On its own this is a low wage; however, achieving this wage is dependent upon there being work available. Adverse climate change impacts to tea bushes could make them less productive and reducing the available work for tea plucking. This, could, in turn have knock-on effects on take home income and subsequent capacity to purchase food. On the other side, it is well documented that climate change will likely result in decreased crop yields (see chapter on Food Security and Food Production Systems). This could reduce supply and also increase the price of crops in markets. Under future climate change scenarios the same wage may result in less food brought home to feed the household. 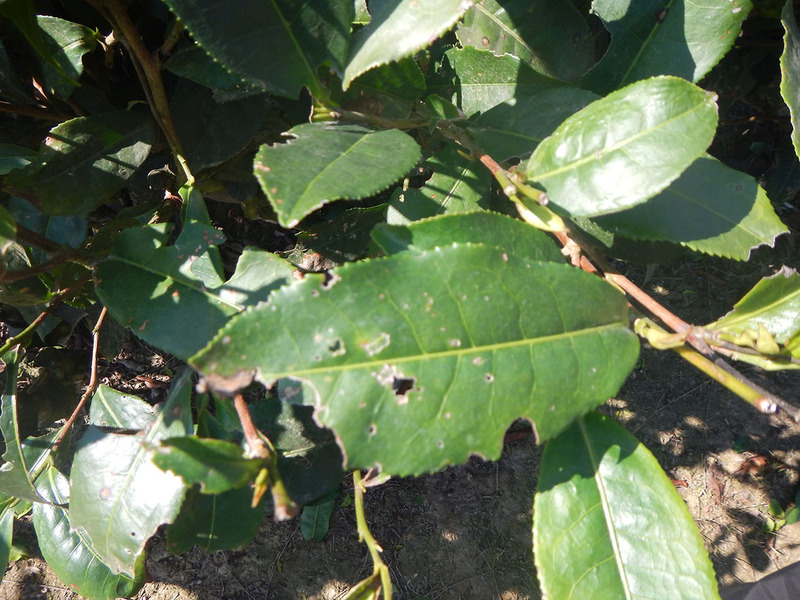 Tea bushes recently attacked by pests; changing pest attack patterns is one of many potential impacts of climate change. Within the tea estates are several small rice fields. Tea plantation workers use the returns from these fields to supplement household food consumption. Numerous studies have documented the vulnerability of rice crops to projected climate change with risks spanning increased warming, shrinking day-night temperature ranges, precipitation variability and extreme heat events. Climate change has the potential to reduce the productivity of these small plots and at the very least increase the variability in returns from them. This will have obvious implications for household food security. Furthermore, the vulnerability of accessing food via these small plots may be amplified by other factors. The tenure and access rights of tea plantation workers to these plots may not be secure. If climate change reduces tea production this land may come under threat if estates expand to counteract productivity shortfalls. Also, tea plantation workers may not have access to agricultural extension and inputs such as new seeds and fertilisers to help them adapt to potential climate changes. Small rice fields amongst the tea plantations in Assam. Finally, an important source of food for many poor and vulnerable households in India is subsidised rice via the Targeted Public Distribution Service. Tea plantation workers, holding a below poverty line (BPL) ration card, will be eligible for rice provisions from the state. Households obtain a BPL card through means testing surveys which happen at infrequent intervals. Initial conjecture suggests that based upon a rigid form of targeting food assistance may fail to come to the aid of households who fall victim to variable and short-term shortages of food resulting from direct (e.g. crop loss) or indirect (e.g. price increases) climate impacts. It is clear that efforts to enhance the well-being of tea plantation workers needs to move beyond focusing on providing increased wages; a much broader, coordinated developmental approach is required. Using the example of food access, increased wages will yield more benefits when coordinated with favourable food markets, and access to productive resources such as land and seeds can be more valuable than increased wages by providing a buffer against market volatility. Furthermore, efforts to improve the livelihoods of workers and labourers in rural supply chains cannot be ignorant of the potential impacts of climate change. How is climate affecting tea quality in China? Is climate change changing the taste of tea? Can producers and consumers perceive such changes? What are implications for farmer livelihoods and benefits we derive from tea as consumers? In this blog we find out more from a team of researchers working in China. What’s so special about tea in China? Tea is cultivated, processed and prepared in diverse ways in China. This diversity makes tea in China very special to me. China is regarded the motherland and centre of genetic diversity of tea with over 1,500 cultivars of the tea plant. It also grows in gorgeous systems from forests to shade-grown gardens to mixed plot fields. I recently returned from a great field season in Yunnan Province of SW China where I sampled tea and interviewed farmers on climate effects on tea quality. As part of this fieldwork, I had the opportunity to eat fresh tea leaves harvested right off the plant – this is one of my favourite edibles. I also drank what seemed like infinite cups of spring tea that the tea farmers I was staying with harvested the same very week. This tea is characterised as full-bodied, complex, and bitter-sweet. What makes tea from these gardens in Yunnan discernible is the lingering sweet after taste that sticks like honey to the back of the throat in a sensation known in Chinese as gaan. When is the best time to taste tea? Anytime! With that said, spring tea harvest has come to be my favourite harvest. The spring harvest is also the most desirable harvest for tea entrepreneurs who make the trek out to the tea mountains from major cities of China in search of the young spring buds. The spring is when the buds and leaves are awakening from winter dormancy and also when the plants grow in relatively dry conditions that are suitable for tea quality. This spring, tea farmers in Yunnan Province shared that the tea harvest started a little earlier than in the past, while being a little later than in previous years. Tea farmers attribute this to changing climate factors as well as to land use change that impacts the local micro-climate. What attributes determine the quality of tea? Tea quality is determined by sensory characteristics and secondary metabolites that impart health benefits for human consumers. Secondary metabolites are compounds that are produced by plants for defense. Unlike animals that can move away from predators or uncomfortable environmental stress, plants are rooted and have evolved defense compounds to protect themselves from a range of environmental stress. Thus, tea quality is intricately linked to environmental, agrarian, and cultural factors. For example, the quality of tea harvested from an organic system is different than that harvested from a conventional system. Or that harvested from high altitudes varies from that at lower altitudes on the same mountain. I have been working in the motherland of the tea plant, SW China, since 2006 to examine how changing environmental and cultural factors impact tea quality. Here, indigenous communities cultivate tea in diverse systems including shade-grown agro-forests and mixed cropping. Leaves harvested from these systems differ in their quality. So why is your research important? 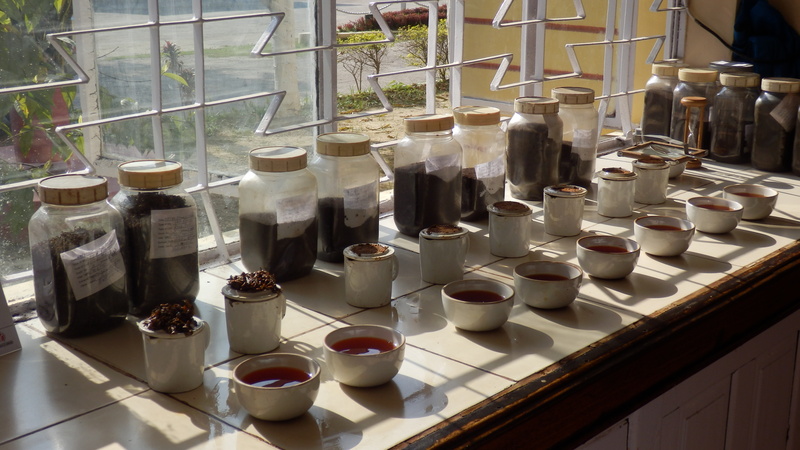 Our research on climate effects on tea quality is important for several reasons. First, tea is the most consumed beverage in the world after water and thus any changes in tea quality from climate change would have consequences for a notable percentage of the world’s population. Second, in many instances, tea is produced by smallholder farmers as a primary source of income. Changes in income derived from tea that are driven by climatic shifts would thus impact these smallholder farmers. Farmers have continuously shared their perspectives regarding how climate factors and seasonality are major drivers of tea quality. Third, our project fills an important research need by focusing on climate effects on crop quality. While it is well understood that more frequent and intense climate events in many areas are impacting crop yields, the impact on crop quality is less acknowledged. Knowledge on tea quality is critical for food systems that benefit both farmers and consumers through high-quality products. The framework developed and tested by our research may be applied to other speciality crops such as fruits, vegetables, wine, coffee, tea, maple syrup, and chocolate – all these products have unique secondary metabolite profiles that are notably impacted by the environment and management practices. How do you measure the effect of climate on tea quality? We are examining climate effects on tea quality through a multi-pronged approach involving field sampling of tea, controlled field and greenhouse experiments, laboratory analyses of biochemicals, sensory evaluation, consumer taste experiments, farmer surveys, and climate modelling. While data exists to create simulations on how tea yields in China may vary with forecasted climate models, there is a lack of information on how tea quality will vary. Consequently, we are collecting tea quality data through sampling of tea during different seasons that have distinct temperature and precipitation characteristics including the spring, summer and autumn season. We started this sampling in 2012 and plan to continue until 2016. In addition to our field site in Yunnan, we are also sampling in Zhejian and Fujian Provinces. At each location, we have a high elevation and a low elevation site. After the samples are harvested, they are used for various sensory experiments with tea farmers and connoisseurs, tea panels, and general western consumers. A portion of the samples are also sent to the lab where they are analysed for key aroma compounds that determine tea quality. What have your results found so far? Preliminary findings from our work have found that tea functional quality significantly varies with extreme weather events, which are becoming more frequent with climate change. Specifically, compared to an extreme spring drought, tea leaves grown during the monsoon at our study site in SW China were up to 50% higher in terms of growth parameters while concentrations of major compounds that determine tea functional quality were up to 50% lower. This suggests that changes in precipitation may have a dilution effect on tea quality or cause drought or water stress. A decrease in tea quality is associated with a decrease in tea prices and income derived from tea sales; which substantially impacts upon farmers’ livelihoods. Our findings validate farmer perceptions that precipitation impacts tea quality. Extrapolating findings from this study to long-term climate change suggests variability for farmers and the need to tap into farmers’ knowledge of management practices to mitigate climate risks in their agro-ecosystems for the sustainability of tea production. We will continue sampling extreme seasonality variability for the next two years and we will carry out controlled experiments with tea plants in conditions that manipulative climate scenarios in tea-producing areas. This work will be coupled with interviews with farmers and consumers. Our studies with farmers involve determining behavioural responses of consumers to climate-induced changes in tea quality and yields and their implications on tea markets regionally and globally. At the farm-level, we are documenting how livelihood changes and tea farmer knowledge of climate effects on crop quality and yields feedback into the way farmers adapt their management and tea processing to adapt to climate conditions. Can you predict whether the Chinese tea will taste different in the future? Ultimately, we will input tea quality into a climate model to simulate future tea quality in different geographic areas on the basis of climate projections. We will also integrate findings from our lab analyses and interviews to use this evidence to develop management plans and policy suggestions for tea agro-ecosystems and processing, and ultimately facilitate societal action towards enhanced sustainability of food systems. In addition to tea, Selena has begun to explore how climate is impacting other speciality crops. She recently received funding with another interdisciplinary team to explore climate effects on maple syrup quality and socio-ecological responses. Selena’s research is funded by the USA National Science Foundation’s Dynamics of Coupled Natural and Human Systems (CNH) Program. The interdisciplinary team of scientists examining how climate effects tea quality includes Colin Orians (chemical ecologist), Albert Robbat (chemist), Tim Griffin (soil scientist), Rick Stepp (cultural anthropologist), Sean Cash (agricultural economist), Corene Matyas (climate scientist), Wenyan Han (tea and soil scientist), and Selena Ahmed (food systems scientist). Each of the team contributes different perspectives and methodologies from their fields to address this interdisciplinary issue. If you have any questions on their research please direct them to selena.ahmed@montana.edu. 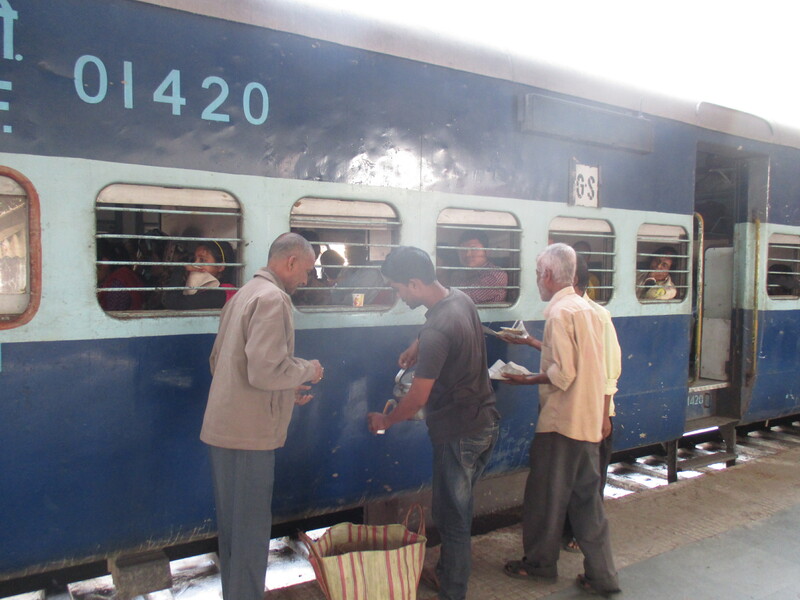 Chai, Garam Chai (Tea, Hot Tea) is a commonly heard welcome call when a train chugs into any railway station in India. The hot cup of tea gives a refreshing feel especially in the early mornings after a night’s journey. Tea and Indian Railways (the largest railway network in Asia and second largest in the world under one management) have closely been associated with each other ever since railways became the main mode of transport in India after its inception during the colonial past. The railway system in India especially for passenger traffic made its first journey on 16th April, 1853 from Bombay (Mumbai) to Thane. The train comprised of 14 carriages hauled by 3 locomotives named Sindh, Sultan and Sahib (which came from Great Britain by ship) and was part of the The Great Indian Peninsular Railway. The proposal to set up a railway system in India was initiated in Great Britain in 1843 by Lord Dalhousie (who later became the Governor General of India) who realised the interest amongst bankers, traders and shipping companies in Great Britain as well as India in train travel. The railways were set up by private companies which received a guaranteed 5% return annually on investment from the British East India Company. Railways in India actually started in western part of the country because a few freak accidents led to the delay of Calcutta, the capital of the British East India Company during that period, receiving the first railways in India. A story of perilous travel on the world’s great oceans: HMS Godwin the ship carrying the locomotive for the East India Railway from Great Britain was misdirected and ended up in Australia, while the ship carrying the railway coaches capsized at the sandheads in Bay of Bengal before entering the Hooghly River. 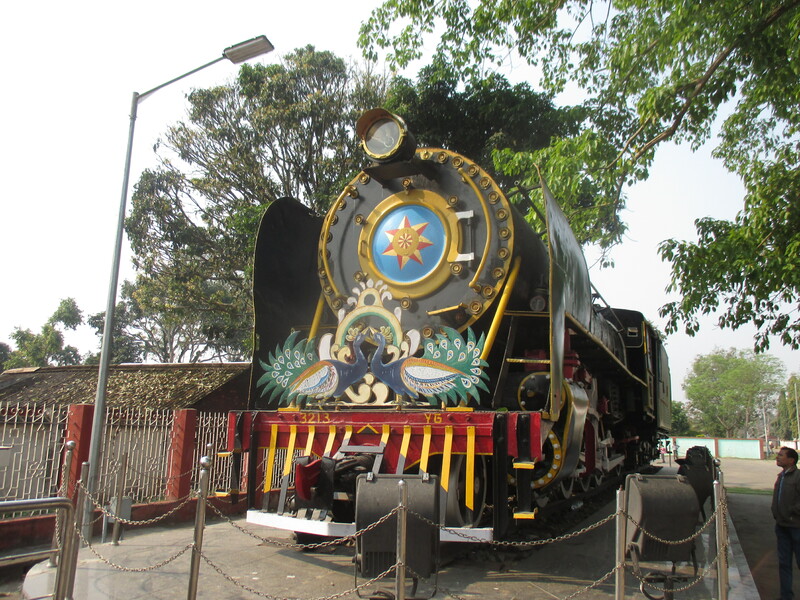 Finally, the East India Railway saw the light of the day on 15th August 1854. Now, Indian Railways is one of the largest railway networks in the world with 64000 km of track covering 7000 stations and catering to 23 million passengers and 2.68 million tonnes of freight daily. Thus the tag line for the Indian Railways: Lifeline to the Nation. Tea was discovered in India by Scottish explorer Robert Bruce in the Upper Brahmaputra Valley, Assam in 1823 being brewed by the local Singhpho tribe much before the railways came in India. The first tea produced in Assam (a consignment of 12 chests) was sent to England for public sale in 1838. With the advent of tea trade in Assam, north eastern India was connected to the port of Kolkata from Dibrugarh (Upper Assam) by the Brahmaputra navigation channel and from Silchar (Cachar) by the Barak-Surma-Meghna navigation channel. The Railways came to Assam in 1881 with the construction of the railway line between Dibrugarh and Makum collieries to transport tea and coal to Dibrugarh. Similarly, the Chittagong port (presently in Bangladesh) was also connected to Assam via Barak Valley in 1903 to transport tea, though the railway fell into obscurity after the partition of the country in 1947. The Indian section of the route is currently being connected to the rest of the country and is likely to be opened by April, 2015. 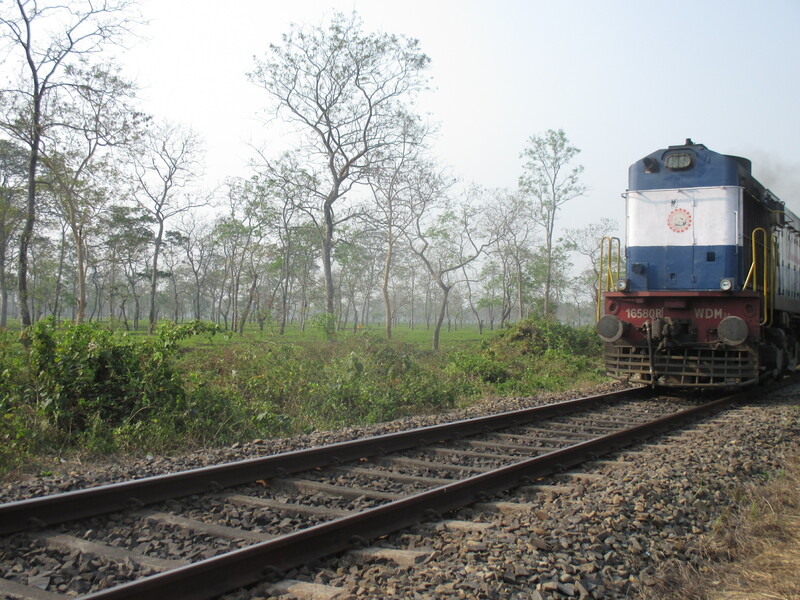 A railway journey through the tea landscape of Assam from Lumding to Dibrugarh is a memorable experience as the train passes through vast stretches of the tea estates in south bank and upper Assam (the largest single tea growing region in the world) and through national parks of the region. Though the railways were introduced to transport tea to the ports (directly or indirectly) for export, the Indian railways presently do not carry much tea as part of its freight which declined by 59% in the 1990s due to increase in road network in the country¹, but the livelihood of a large number of vendors selling tea are dependent on the Indian Railways passenger traffic. From my childhood days I had a fascination for railway journeys and the thing that hasn’t changed much over the years are the tea vendors (chai wallahs as they are commonly called in India) with a kettle and a bucket of cups getting on, moment a passenger train enters a station and in some cases they are on the train even before the train has come to a halt. Incidentally, they are the last person to get down after collecting their dues when the train has already picked up enough speed. I always wondered why they risked their life so much for selling just a cup of tea. No statistical figures exist of the number of tea vendors who earn their livelihood by selling tea in the Indian railway network but it accounts for a major livelihood source for a considerable section of the population. In accordance, Indian Railways have also given importance to the tea vendors by introduction of licensed tea stalls at all railway stations and automatic vending machines in some stations keeping in mind that tea is one of the most consumed beverages of the country. The vendors have also brought in innovations in the way tea is prepared and served to the passengers in form of masala chai, lemon tea or ginger tea. The tea industry of Assam, North Bengal and South India caters to the 23 million passengers that Indian Railways carry everyday through a few thousands tea vendors, thus critical in supporting their livelihoods. Trains and tea are two very important flag bearers of the Indian economy; jointly promoting the most consumed beverage in the world.